In information technology, multiplexing schemes are used to transmit more signals than the number of available transmission channels. Researchers at ETH in Zurich have invented a novel method whereby information is encoded in the correlated noise between spatially separated light waves. To send as much information as possible from A to B at the same time, scientists and engineers have developed increasingly sophisticated techniques over the past decades. Those techniques, generally known as multiplexing, allow one to transmit more signals than the number of available transmission channels. A typical example for this is radio broadcasting on different frequencies. Scientists at ETH in Zurich have now invented a novel multiplexing technique that is based on noise – something that one typically tries to avoid. Shawn Divitt, who initiated the development of the new technology two years ago when working as a Ph.D. student in professor Lukas Novotny's research group, had almost finished his dissertation when he came up with an idea. In a double slit experiment – a classic in the history of physics—he had investigated how correlations between the light waves in the two slits are created and how they affect the interference pattern. Correlations indicate how well one can predict, for instance, the oscillatory phase of one light wave if one knows the phase of the other wave. Even if both phases are "noisy," meaning that their values fluctuate, they can still do so in a more or less synchronized fashion. If the correlations are strong, a clearly visible interference pattern appears on a screen behind the slits in a double slit experiment. Weak correlations, on the other hand, cause the interference pattern to be washed out or disappear completely. "The idea was to generalize that principle and to use it to encode information," Divitt explains. To that end, he calculated the correlations between several spatially separated light waves, which can, for instance, be transmitted through an optical fibre. 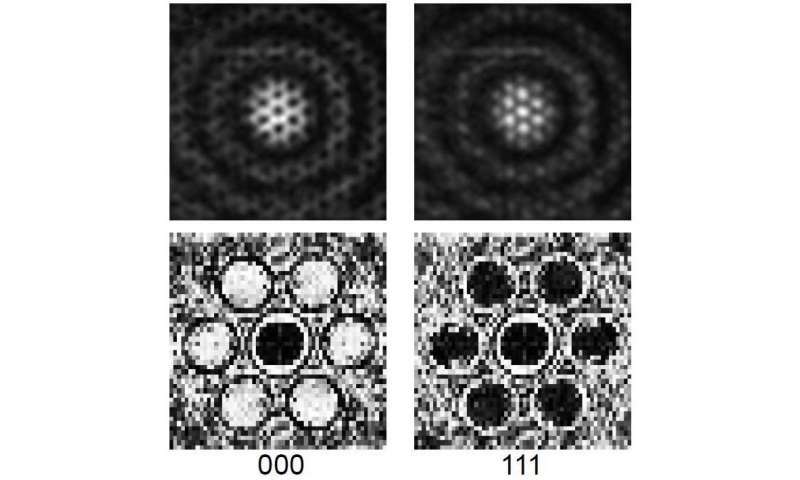 "What's interesting is that the correlations exist between pairs of light waves, which means that the number of those correlations does not increase linearly with the number of light waves, but roughly quadratically," says Divitt. In principle, therefore, it should be possible to transmit six bits of information using four light waves, 28 bits using eight light waves, and so forth. The value "1" of a bit can then be represented by a positive correlation (synchronised noise), and the value "0" by a negative correlation. On paper this type of "correlation coding" worked perfectly. To make sure, however, that it could also be realized in practice, Divitt also wanted to test in an experiment. There was one problem, though: Divitt is a U.S. citizen, and his visa expired towards the end of his doctorate. So, he took a rather unusual approach. Before returning to the U.S. he set up an experiment in Novotny's lab in which the encoding of information in an optical fibre bundle is simulated using a so-called spatial light modulator. The correlations between the light waves are manipulated and later read out with the help of an interference pattern. Back in the U.S., Divitt started the experiment – by remote control from his computer. In the meantime, colleagues in Zurich made sure that the experimental setup was always in good shape. Afterwards, Divitt analysed the results in his "home office" and found that his method did actually work. He and his Ph.D. advisor have since submitted a patent application for it. "Of course, doing research like that is somewhat unusual," Novotny comments. "Moreover, it was only possible because ETH provides people with the necessary freedom to test wild ideas now and then – if necessary, even from far away." 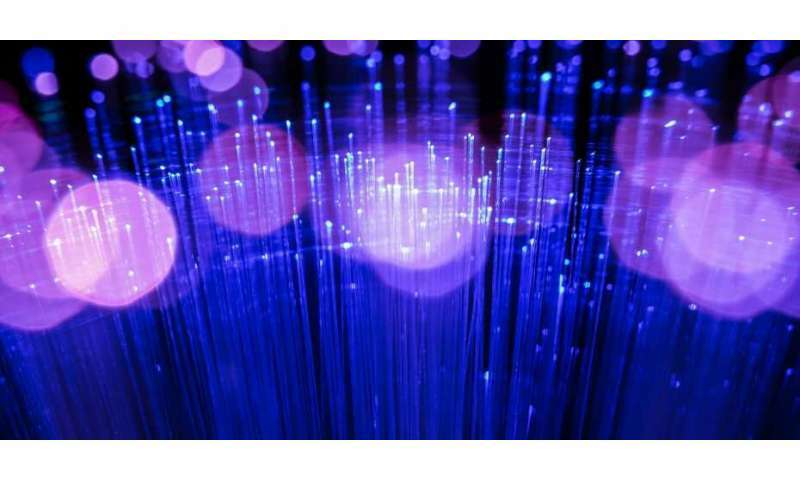 Divitt and Novotny hope that, on the one hand, their method will be able to increase the data capacity of fibre optic cables even more. As their method does not require coherent laser light, it should also be cheaper than conventional technologies. On the other hand, correlation coding could also contribute to data safety. Since the oscillations of light waves cannot be recorded in "real time" due to their high frequency, a possible eavesdropper would have to divert a considerable part of the optical power in order to obtain an interference pattern and hence intercept the information. That, in turn, would be noticed immediately, which would expose the eavesdropper. Novotny intends to get a new Ph.D. student on board and to further investigate the pros and cons as well as possible applications of correlation coding. By now, Divitt lives in the Washington, D.C., area with his family of five, where he works as a research physicist. He has fond memories of his time in Zurich and of his remote controlled experiment. As a young Ph.D. student he acquired the necessary work ethic to pull off such a project. "When I started at ETH, we already had our first son, so I had to be well organized right from the beginning," says Divitt.